This view of the McElraevy & Hauck building at 440-444 Broadway, Brooklyn, appeared in The Plumbers' Trade Journal, Steam and Hot Water Fitters' Review, 15 April 1905. 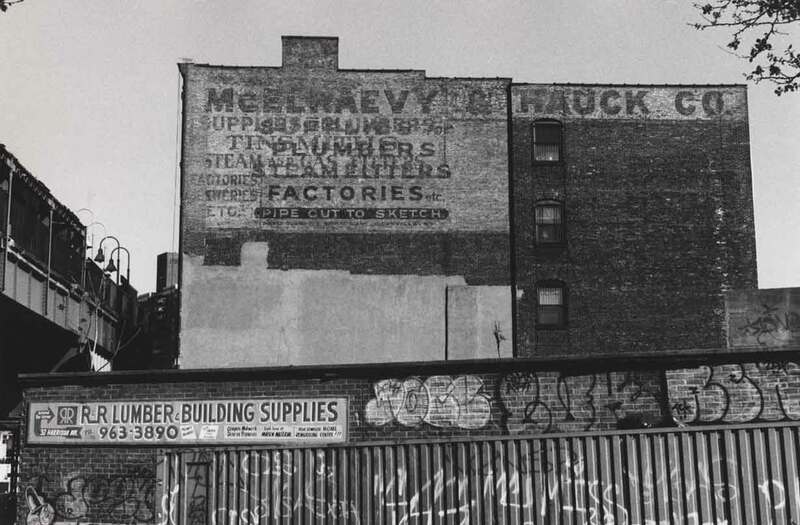 The plumbing supply house of McElraevy & Hauck was located here at 440 Broadway, Brooklyn, from approximately 1904 to 1978. McElraevy and Hauck were John McElraevy (1855-1939) and George W. Hauck (1860-1930). The Metal Worker, 15 October 1898, reported that John McElraevy at 477 Broadway, Brooklyn, was "distributing a seasonable circular letter recounting his ability and facilities to do steam pipe work and especially exhaust steam heating." Apparently McElraevy had a plumbing supply house at this address prior to going into business with Hauck. An undated photograph of this establishment is posted on ancestry.com with storefront signs reading "John McElraevy 477," "Contractor for Steam Heating and Pipe Work," and "Pipe, Valves, Fittings, Brewery, Factory, Plumbers Supplies." This photo is linked to John McElraevy and his son, William McElraevy (1879-1945). The two men posed at the entrance are probably father and son. 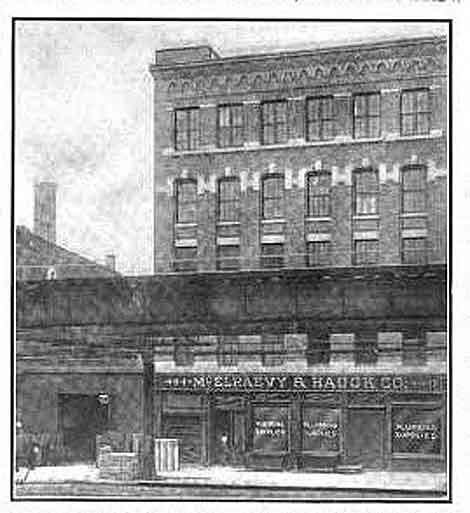 McElraevy & Hauck was listed at 477 Broadway in a Brooklyn Business Directory dated 1899. In 1900 their address changed to 488 Broadway, and then in 1904 to 440 Broadway. Both John McElraevy and George Hauck appear in the 1900 U. S. Census, living in Brooklyn, and giving their occupations as "Steam Heating" and "Plumber Supplies" respectively. Other than John McElraevy's son William, I found no others connected with the business until 1909 when of a sudden Martin Dietrich Fink (1856-1917) appears as president of the company. In the 1911 Directory of Directors in the City of New York Martin D. Fink was president, treasurer and a director at the Manhattan plumbing supply company of Dimock & Fink on East 125th Street. Dimock & Fink have left an iron grating in the sidewalk on Hudson Street, and their history can be found on the Dimock & Fink page. This ad appeared in Library Bulletin, vol. 1, no. 5, Bay Shore, N.Y. November, 1909, showing Fink, McElraevy and Hauck as company officers. Martin D. Fink died in 1917. George W. Hauck appears in the 1920 U. S. Census living in Dutchess County, NY, when his gave his occupation as None. And John McElraevy, although still in Brooklyn, also gave his occupation as None. At this point two new figures appeared as manager/proprietors at McElraevy & Hauck. These were Charles Kimmerle (1871-after 1940) and Henry Schumacher (ca.1879-after 1940). Henry Schumacher appears as a "superintendent, plumbing supply," living in Woodlawn, Queens, in the 1915 New York State Census, and "manager, plumbing supply" in the 1920 U. S. Census. Charles Kimmerle was "superintendent, plumbing supply," living in Rosedale, Queens, in the same 1920 census. By 1940 Charles Kimmerle had retired to Long Beach, NY, but Henry Schumacher, living on Hollis Court Blvd., Queens, was still an "official" connected with wholesale plumbing supplies. According to www.realdirect.com McElraevy & Hauck sold their Broadway property to Action Apparel for $0 on 23 Oct 1978. For a few years (through 1985) the company continued in the Brooklyn telephone directory at 2 Heitz Place, Hicksville, NY.